Since everyone else is posting their horsies, I thought I'd add mine. 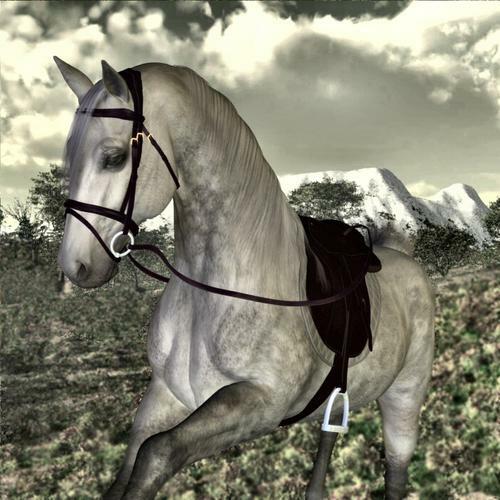 On a somewhat related note though, I don't seem to have textures for the bridle. I'm sure I installed all the packages and nothing else seems to be missing, but it does seem odd that I have no materials for it. 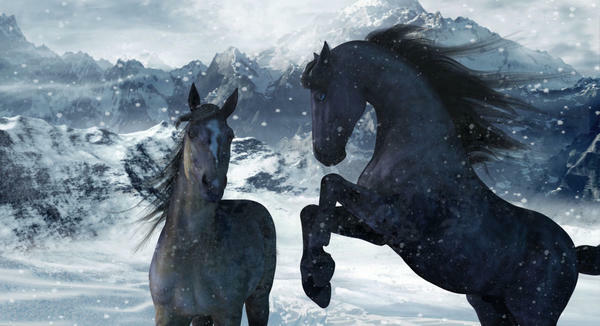 Oh well, on with the horsies! Does anyone like the new horse's tail and mane? 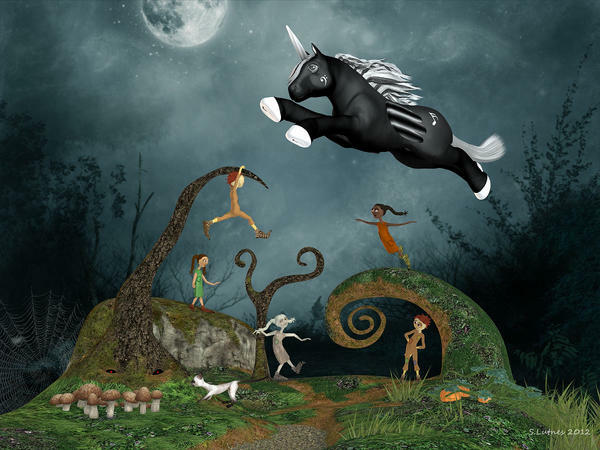 I'm afraid I don't — IMHO the mane morphs are a bit limited, to say the least, and the tail is not easy to pose. I've yet to get them looking all that realistic in a render, too. Either the hair looks too regular, or too randomly flung about, there doesn't seem to be anything in between. Well, I missed this and it's so beautiful. Thanks for sharing it! I highly doubt it. I can only assume they were rushed and made conforming in the hope that PAs would fix them--which hopefully will happen before too long. Stezza ..... ummm where did you get the horse pattie?? This one was fun! I wanted to play with the pony too. Moondance. Grane wings parented to the DAZHorse2. DS4.5Pro render, postwork in GIMP. Larger version in my deviantART gallery here. 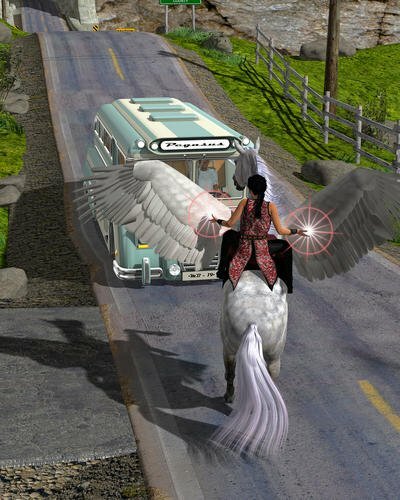 I love the winged horse as much as anyone, but my money's on the bus winning this stand off. Ah yes but ... Pegasus is magic, made by the Gods for the Gods and friends. The bus is just a bus. 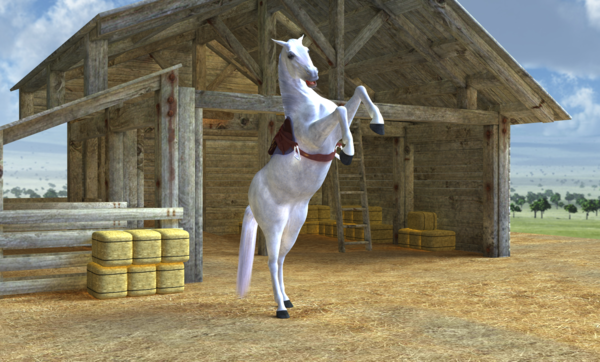 And a quick horse render. Just an ordinary horse. 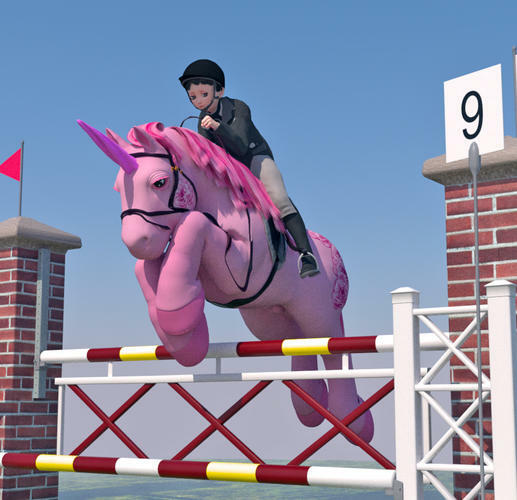 Wish I'd seen this earlier lol, just about finished remapping the horse and came on here for help getting the new materials to load with the uvs. Very kind to do this and very quick work too! Thanks! I made it to go on my facebook page.... I love the new horse! I thought it was a photo. Lighting and coloring match so well. I love it. That the Planet Alpine skydome? No, I buy backdrops at renderosity. I think she uses daz content and some of bryce, as I've noticed some elements (like moongate and such). The backdrop is called. Winter landscaps by Melkor. IT is possible she uses some sort of skydome, although this set predated planet alpine so I'm not sure whence its origin. Then I touched it up with some snow brushes bought at rendo to add more foregound snow and an icey overall feel to the pic. 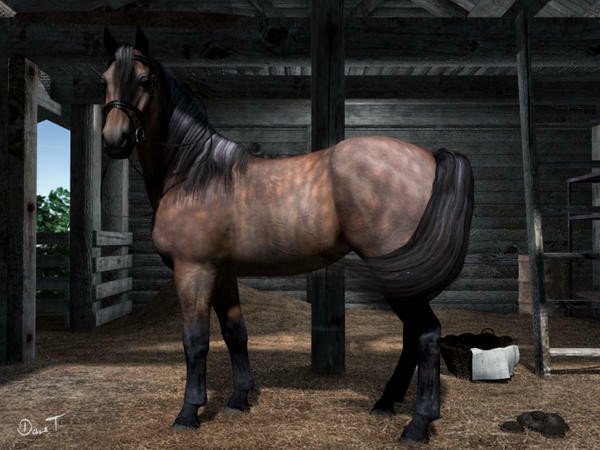 It works great for using MilHorse textures on the DH2 and Autofiting MilHorse stuff to it -- a wonderful and timely resource! 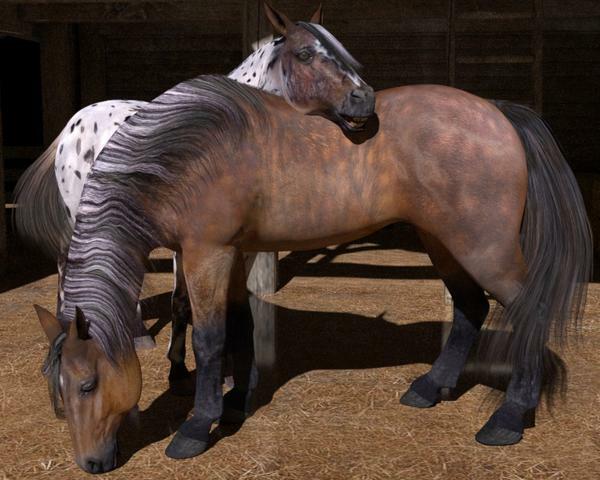 Doesn't help with mapping low-distortion costumes for the Toy Horse though, or even low-distortion quarter-marks, since the MilHorse and DH2 have such similar UV layouts.